It has turned out to be one of the hottest summers on record here in Texas. Until just last week, the DFW area had not had a day where the recorded temperature sunk back into double digits since early June, when the first post on this subject came out. Since then I’ve been steadily tracking my electric bill, and the results have been eye opening. To my utter surprise, a pair of small, window-mounted a/c units positioned in the bedrooms plus the sharp control over the central air unit has almost cut our bill almost in half for the entire summer. Last year’s bill for the same months shows that my household ran somewhere in the neighborhood of 2500 to 2800 kWh (Kilowatt hours). Compare that with this year for the same three months with warmer temperatures, and running with the window units and a different cooling plan on the central unit — it ran 1350 to 1800 kWh. Now of course to get the “real” savings numbers, one would have to track the price of energy over the studied period plus the ambient temperature of the the outside air, central a/c unit efficiency over time, and myriad other variables to say with scientific accuracy what was gained or lost. However, for me, just a few changes in my a/c program and $200 in window units pocketed close to $450 over three months’ time, which puts me $250 ahead of the game in one of the hottest summers on record. It may not be much, but I’m calling that a win. Impressive… I am even more tempted to do something like this now. My problem is, if the wife decides to get a dog, how to keep said pooch cool during the day? Maybe I am just too worried about it since I am used to taking care of a Siberian Husky (he would just sleep in the freezer if you let him). The nice thing about dogs — domestic animals in general, actually — is that they’re smart enough to figure out a thing or two on their own. We’ve always been A/C stingy, so we set the whole-house thermostat to 84 and run a window shaker set lower (80 usually) in the bedrooms. The animals find the cool when they need it..
Can’t forget that one day last month when it rained that kept us from the consecutive days record. We haven’t done anything so rigorous as you’ve tried, but the supplemental wall unit in the master bedroom has been a lifesaver for us. Apparently, it also drowns out all but the very worst of my snoring. @Joe – have you considered outdoor misters for the dog? Some friends of mine have set them up in their dog run, claim that they reduce the ambient temp by 15 degrees. A few years ago our central air unit went out and we were forced to use 2 window units for about a year and a half. We found our electric bill in the summer was cheaper (the central heat still worked). When we got the central air unit fixed our bill went back up. have you ever tried a aquacool mat for the dogs, it’s a mat with water absorbing pearls in it. You dunk them in water for about 10 minutes and this water slowly evaporates. You can allso get them as collars. I live in Queensland Australia and it can get very hot there. Brought my dog from the Netherlands, so he wasn’t used to the high temperatures, but with the collar on, he is as lively as our Australian terrier. About 5 years back I built a 2 story addition which doubled the sq. footage of our home. At the time I installed ductwork for central a/c throughout the entire building, planning to do away w/ the 3 window units we had been using. I found, however, that the 3 units (total BTU = 20K), accompanied by a floor fan & ceiling fans, are very cheap to run. To obtain the same flexibility of operation I would need a 3 zone central system. I have been following these threads with much interest. I don’t have much experience with HVAC but I keep wondering; Why does substituting window units work so well? No one has a bad story. Are central air units just not tuned for a house out of specific dimensions? Or has the technology in window units jumped drastically to make them more efficient? Or is there some kind of commercial conspiracy to install big expensive units that will be pushed to their limits so that they will cost more to run then break down and you have to spend a ton of money replacing them? Seems to me, if I was ever to build a house, I would integrate hidden window/wall units into each room. That way I could have complete control over the temp in each room and if the AC ever “went out” it would only be one unit instead of the whole house and that unit would be swappable with any of the others. I guess my question is; Is central AC a scam? Is it something we are all duped into buying because it is supposed to be better and more modern but doesn’t really work that way? It’s not a scam. It’s all a matter of zoning. It’s much cheaper to cool two rooms than a whole house. If you put a window unit in every room, it would be more expensive to run than central air. None of this is news to those of us further north, who may use space heaters in bedrooms at night, or otherwise zone a radiant heat system. Air systems can be zoned too, but it’s difficult. (I’m not an expert on the matter). At a minimum, you need a system with a variable speed fan. Even then, the compressor / heat exchanger are designed for a certain air flow. If you close off too much of the system, you won’t get the right air flow and you’ll freeze over or do other bad things. For this application, a mini-split system works really well (though more expensive to install). I’m not sure if the central AC’s main point was necessarily energy efficiency. 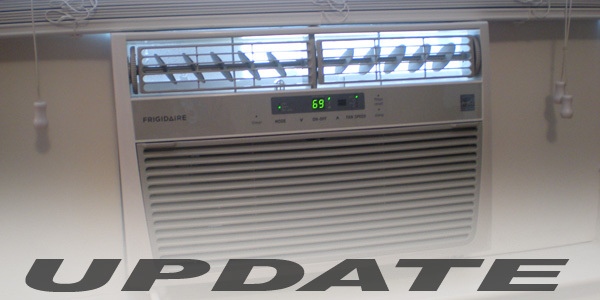 Central AC is generally much quieter than window units. As an asid did you happen to paint your house a lighter color since last summer? or replaced dark shingles with ones that reflect more light? or maybe new attic fans? I know I moved from a 1970’s home with central ac retro fit to a brand new house with 400-500 more sqaure feet and more windows for sun to shine into but my cost for AC has been much lower. Probably the greatest benefit of a central system is the ability to filter all air being introduced into your home environment. The de-humidifying capability of a central unit is also superior, or at least easier to control. The plus for room units is that you won’t roast if one fails! Hmmm… so I wonder if I should invest in free standing unit. Thanks for the update and it gives us something to think about. One that dropped the temperature in our house drastically (I estimate 10-15 degrees) was to use double-sided tape to mount mylar emergency blankets in all of our south-facing windows. They weren’t perfectly smooth, but, at a dollar a piece, you can’t beat the price! As a bonus, they only reflect ~95% of the light, so you can still see clearly out through them. For the “scientific” analysis, you can get monthly heating or cooling degree-days from the National Weather Service or other sources. I’ve been doing similar analysis for heating degree-days vs. propane usage to assess the impact of our adding a heat pump two years ago. The heat pump runs until 25 degrees F, at that point the propane furnace kicks in. What I’m trying to determine is an algorithm to estimate the amount of propane I will need to purchase on a pre-pay contract. Don’t forget to check your attic insulation! I went in with my neighbor on blown in insulation from the Orange big box to get the free day’s blower rental. I put in $250 worth of insulation into the attic of my 1500 square foot house back in April; for just June, July, and August, I saved over 4000 kwh (kilowatt hours) and I’ll be saving all winter too. Exactly what Jason said. This has nothing to do with the window units. He is just cooling a smaller portion/zone of his house. You can reduce your bill even more by simply removing the window units and going back to central air. Just limit it to these rooms. The only semi-complicated part is making sure your system is only measuring the temperature of these zones/rooms. Any local HVAC guy could upgrade your whole house for zone cooling. That way you can select what rooms you want to cool as you wish with the press of a button… or timer. We keep the entire house hot until an hour before we get home from work.. then only the living room/kitchen is cooled. Close to bed time the bedroom gets cooled down. Our bill is easily <20% of what it was. Central air is always a more efficient method of cooling so long as it's used the same. It's like comparing the mpg of a petrol and diesel car while they're going two different speeds. … a little unfair.